A DVD creator tool for creating DVD-videos form video files ! 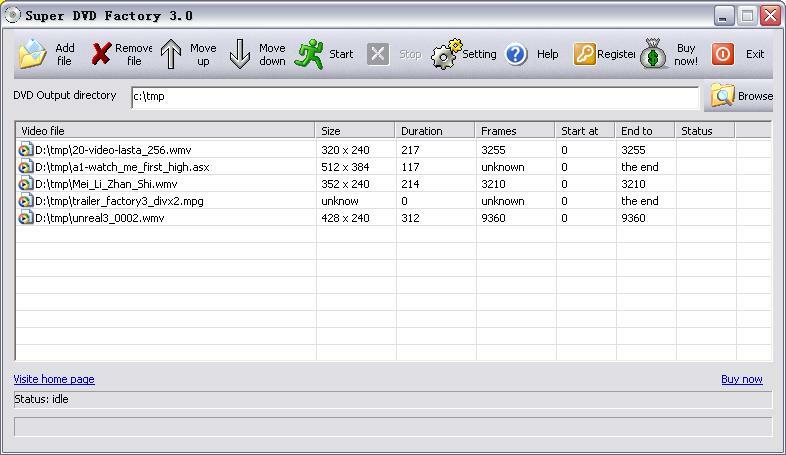 Super DVD Factory is a MPEG2 Encoder and DVD Authoring Tool. MPEG2 Encoder. Super DVD Factory can extract audio and video tracks from your input video clips and encoding them to MPEG2 format. DVD Authoring. After done the extracting the video and audio files and encoding, Super DVD Factory can help you to generate DVD Video format from the encoded video and audio files. All you need to do is just inut your video clip files and Super DVD Factory will help you to do all the things, a few clicks is ok.
Fast High-Quality Mpeg2 encoder engine inside. Pefect Audio and Video Sync. SWF Video Converter - Convert SWF to AVI MPG MPEG GIF DVD. ASF Converter - Convert ASF to AVI, ASF to MPG MPEG easily. Amigo DVD Ripper - Copy DVD to VCD SVCD AVI in Several Clicks. ACA Screen Recorder - Captures the action from your Win screen. Enough free disk space for store DVD output. for large files, NTFS file system is required. Window Media player version 9 or above.